Augochlorella striata (aurata), photographed by Gretel Kiefer. 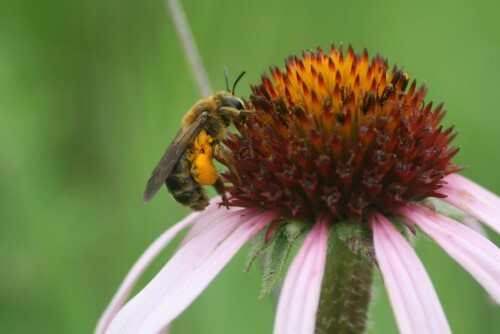 This is a guide to the bees that visit Echinacea at our study site in Minnesota during the summer field season. 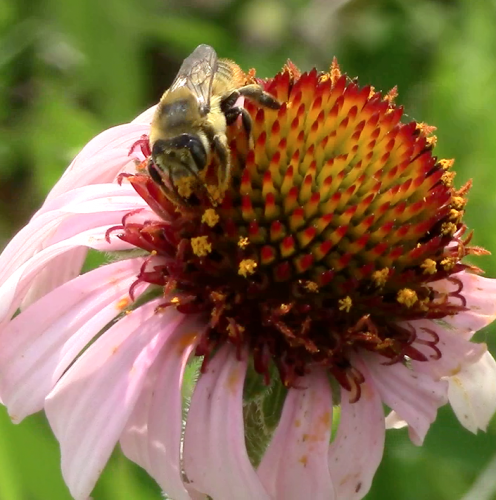 The Echinacea Project has collected over 900 specimens and 43 species of native bees. 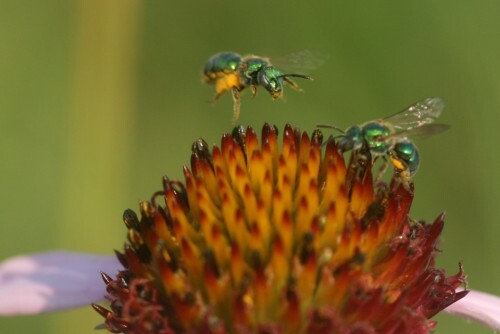 Each page of this guide includes a description of a native bee taxon to be used for quick identification (as well as the link to DiscoverLife to be used as a tool in more accurate identification) and life history traits such as nesting and foraging habits. 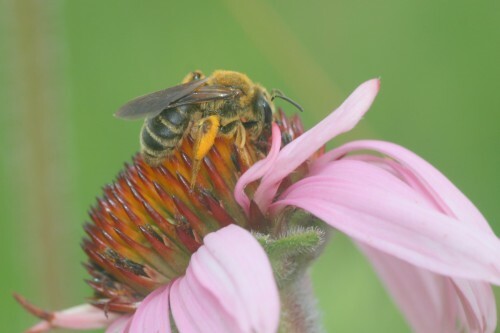 Also included are the common name of a genus, the number of species and specimens The Echinacea Project possesses of these genera and species, and pictures and videos from the Echinacea Project Youtube of the bees collecting pollen on Echinacea in the field. The pages are organized by both family and genus, and information on individual species within a genus are included where we have that information. Andrena, photographed by Gretel Kiefer. In contrast to solitary bees, social bees such as honeybees and bumblebees are attracted to the nectar stores of native plants, which they use to create energy-rich honey for their offspring. 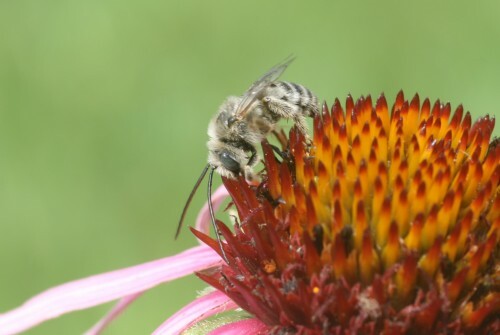 Social bees are not visitors to Echinacea on our study site, perhaps because they are less likely to visit plants with less bountiful nectar, such as Echinacea. Solitary bees do not produce honey and are attracted to a wide variety of plants for their pollen, which they bring back to their nests to feed their larvae. 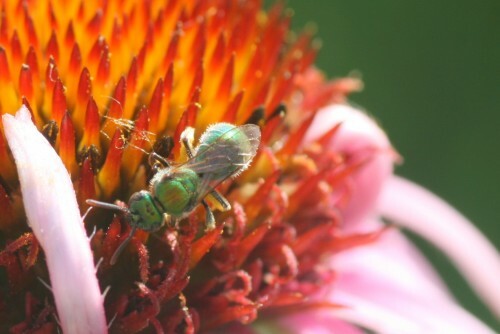 Foraging habits are more or less consistent among the collected native bee specimens. The vast majority are generalists, meaning they visit many species of flowering plants, imposed by their tongue length and size (Mader et al. 32). And for further use in identification, there is a helpful guide for Echinacea-visiting bee identification, created by team member Stephanie Pimm. Mader et al. Attracting Native Pollinators: Protecting North America’s Bees andButterflies. 2011. The Xerces Society. Wagenius, Stuart and Pimm Lyon, Stephanie. “Reproduction of Echinacea angustifolia in fragmented prairie is pollen-limited but not pollinator-limited”. Ecology, 91(3), 2010, pp. 733–742. 2010. The Ecology Society of America. 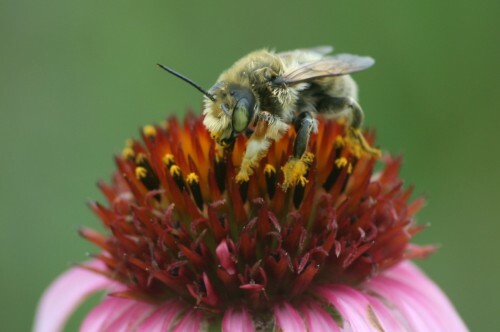 Bee on Echinacea, by J. Pfeil.